I recently acquired a Kindle for my birthday, after reading a few books on my Mum's and absolutely loving it. A few of my friends have them too so I decided to give it a go. And I LOVE it. If anyone's been living in a hole for the past two years and doesn't know, a Kindle is an electronic reading device made by Amazon which allows you to store thousands of books in a tiny device and read them on a screen. The screen is particularly awesome because it is just like paper: not illuminated and doesn't hurt your eyes. It's just like reading a book just without having to turn pages - you use a button for that. The kindle comes in a neat little box with a charger cable (you need a computer or plug adapter to charge it). You can connect it to your Amazon account and go online using wi-fi or 3g which the Kindle comes with (mine is just wi-fi, which is fine, but 3g can be useful if you're on holiday). I was lucky enough that my friend Alex bought me an Amazon voucher for my birthday, so I loaded it with some books straight away! In terms of being user friendly, I find the kindle really easy to use as there are simple instruction guides (although you may not need these) and plenty of controls to allow you to browse and read with ease. The internet can be difficult to navigate, especially with my version that has an on-screen keyboard, but that doesn't matter, as the Amazon store is specially set up to be kindle- friendly. There are turning buttons on both sides so that you can turn with either hand, making it comfortable for right or left handed users. The kindle is a plastic material but the back feels grippy, and so is easy to hold safely. The battery life seems very long, having only had to charge it two or three times this month. Aesthetically, the Kindle looks wonderful: sleek and a large screen, with a font that is adjustable for size and style. One of my favourite things about the Kindle (apart from being able to read all these amazing books so easily) is when it's put on standby, a picture fills the screen. Depending on the model these could be of famous authors or writing materials (pens, pencils, typewriters etc). To those of you who are still not convinced, I can assure you, I've heard it all before: people saying "no, I have to have a real book" then suddenly converting and falling in love with the Kindle. If you're STILL not convinced, borrow one from a friend and read a book or two (although good luck finding someone willing to part with it). 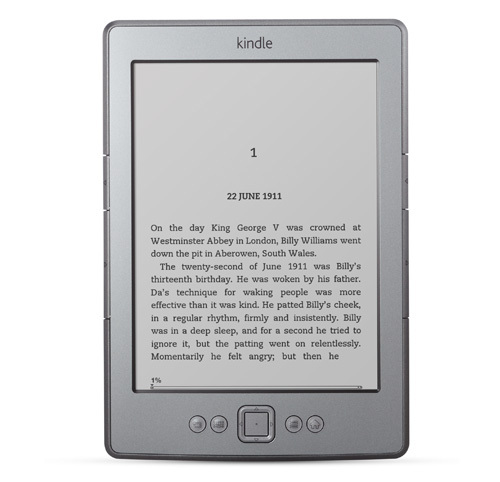 Leave a comment with your opinion on the Amazon Kindle! :) Happy reading! Hi, I'm Freya, I'm 15 and from the United Kingdom. This blog is about anything really, I hope you like it, please follow :) Oh, and as you can probably guess from my photo, I LOVE playing the violin. I might blog about it here sometime. It's Summer and I'm back! Copyright © Freya's World. All rights reserved.